The October 23, 1991 Comprehensive Cambodian Peace Agreement referred to as the Paris Agreement. · Declaration on the Rehabilitation and Reconstruction of Cambodia. 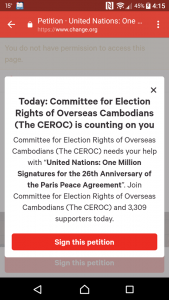 This Paris Peace Agreement provided provisions to promote national reconciliation and to ensure the exercise of the right of self-determination of the Cambodian people through free, fair, and transparent elections. In addition, they provide for a ceasefire and cessation of outside military assistance and for the withdrawal of foreign forces from Cambodia. They also deal with Human Rights protection including the voluntary return of refugees and displaced persons and delineate the Mandate of the United Nations Transitional Authority in Cambodia (UNTAC). 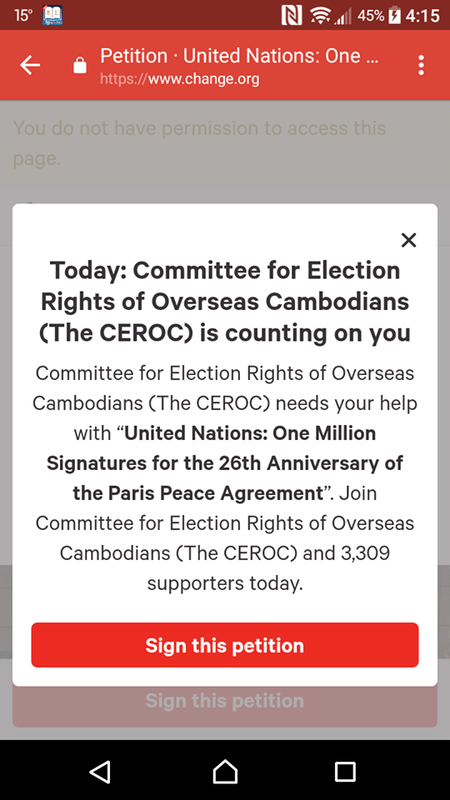 On its 26th Anniversary, we, the Cambodian people of both domestic and abroad wish to collect one million signatures and send them to the party signatures countries of Paris Peace Agreement-Cambodia. The eighteen (18) countries included the French and the Indonesian Foreign Minister acted as co-Presidents. Also participating in his official capacity was the Secretary-General of the United Nations. Especially, the five permanent members of the Security Council: China, France, the Soviet Union, the United Kingdom, and the United States. We, the Cambodian people need to remind them that, Mr. Hun Sen is breaching and violating this Paris Peace Agreement; it is unacceptable! Therefore, we, the Cambodian people needed the party signatures countries more than ever to enforce the Paris Peace Agreement. The Dictatorial politics led by Mr. Hun Sen in Cambodia violated all the provisions in the Paris Peace Agreement. Cambodian people need your immediate intervention. Otherwise, Cambodia and her people will never live in with dignity, grace, and integrity. We condemn, in the strongest terms, the calculated and systemic crackdowns on Democracy– 1991 Paris Peace Accords, Opposition Parties, Non-governmental organizations, Unions, and Independent Media, ahead of the upcoming Senate election on January 14, 2018 and general parliamentary election on July 29, 2018. These recent political developments are strangling Cambodia’s fledgling democracy.